In sifting through puppy pictures we’ve taken in the past month, I happened back across a few weeknight pasta dishes that I’ve made, and which we were pretty pleased with. It hardly seems fair to let them languish in iPhoto while writing about more blustery dishes like roasted chickens, jagerschnitzel, and legs of lamb, so here you go. 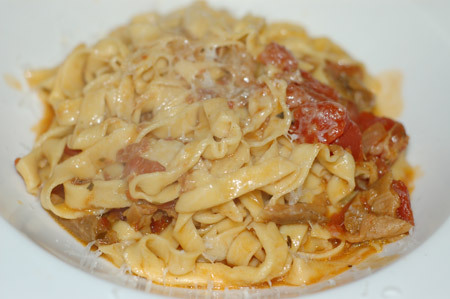 Back in the first week of May, I was rooting around in my trusty Marcella cookbook for a pasta dish, and hit on her Amatriciana, a sauce that is usually made to accompany bucatini, a fat spaghetti-ish noodle with a hole in the middle like a hose. Since I’ve never yet found bucatini for sale in Oregon, I substituted rigatoni. I added a tablespoon of tomato paste to the onions before adding in the canned tomatoes, for extra depth of flavor. I also used thick-cut bacon in place of the pancetta called for, since the only pancetta I can find is presliced transparently thin. 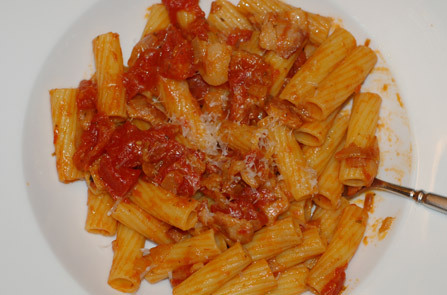 Jeremy, I noticed, picked out every bite of bacon and just ate the pasta and tomatoes, likely because the bacon wasn’t crisp after simmering in all that sauce, but the pasta had a lovely bacony flavor nevertheless. And Freyja liked the bacon, so we gave some of it to her for obeying commands like sit, stay and leave it. A few days later, I made a shrimp pasta based partially on Spanish tapas flavors and partially on shrimp a la Buzara from watching Lidia’s Italy. 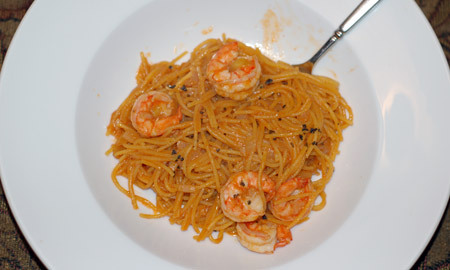 I used ¾ lb of shrimp (thawed and peeled, pre-deveined) and a box of quinoa-corn spaghetti. Here’s a rundown of what I did, since Jeremy seemed to like it and I thought it was pretty tasty as well. In a large stockpot, get the water for the pasta boiling. In a sauté pan, heat the oil over medium-high heat and add the onion. When it begins to turn translucent, add the garlic and a good sprinkle of salt, and cook until the onion begins to brown and the garlic is fragrant. Stir in tomato paste and a grind of pepper, and stir for a minute or two to cook the paste; then add the sherry. Stir through and allow it to reduce for a few minutes. By now the pasta water should be boiling. Toss in some kosher salt and the pasta, and cook for about 4.5 minutes. Meanwhile, turn the heat on the sauce down to medium and add the shrimp, turning them over once they have turned pink. When they are done, the sauce should have thickened somewhat but still be rather loose. Add the sherry vinegar, and seasonings to your tastes. Drain the pasta, reserving some pasta water if your shrimp sauce seems too thick; the pasta should be on the hard side of al dente and will finish cooking in the sauce. Combine the pasta and sauce and toss through; if it seems tight, add a bit of pasta water to loosen it up. Stir and combine for a minute or two more, until the noodles have soaked up some of the sauce and finished cooking to al dente. Serve in warmed pasta bowls with a sprinkle of black sea salt for garnish. We liked the pasta just fine, but it could use some tweaking. I think I added a bit too much vinegar, so I compensated with some other spices, but it all balanced out once it soaked into the noodles somewhat. We couldn’t tell the spaghetti was wheat-free, and I think the corn flavor worked well with the shrimp and tomatoes. Jeremy suggested some chile flakes added next time, and I had actually considered adding some, so that’s something to remember. All in all, it was pretty tasty. On the 17th, after a vigorous walk with the puppy, I pulled out that trusty Marcella again and found a recipe for tomato-porcini pasta sauce that sounded like just the ticket. I headed for the kitchen and got that simmering. It’s a very simple recipe: pretty much just onion browned in some oil and butter, a bit of pancetta, a can of diced tomatoes and a good handful of reconstituted dried porcini with soaking liquid, all simmered together for an hour or less. When the sauce was almost ready to go, I recruited Jeremy to make some fresh egg tagliatelle for us while I cleaned up in the kitchen some, and it all came out really nicely. The sauce had good flavor, even if it was a little soupy. That might have been because I didn’t simmer it hard enough, or maybe because there was a lot of water clinging to the pasta when we transferred it to the sauce. It didn’t bother Jeremy one whit, though… just gave him a reason to get out some bread to soak up all that porcini goodness. Update 9/21/07: Tonight’s dinner was pasta with the tomato-porcini sauce. I think Jeremy forgot we had had it once before with rousing success, and was unenthusiastic until he started eating. Then he commented several times on how good it was. This time around I used some whole wheat-flaxseed penne from Trader Joe’s, and although it was a bit thick, it stood up nicely to the flavor of the sauce, which was not too soupy.